3' x 5' Made of Quality outdoor polyester material. Finished with reinforced canvas header and two brass grommets. 100% Made in America. 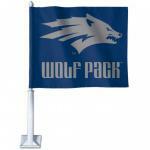 This flag is 3' x 5' and made out of a great outdoor quality solar max nylon. 100% Made in America. 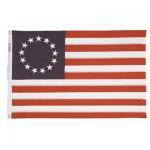 This 2 1/2'x4' antiqued cotton Heritage 13-star Betsy Ross banner style flag has pole sleeve and sewn in tabs. Flag features sewn stripes and embroidered stars and is antiqued for an authentic, weathered look. 100% made in the U.S.A. Pole Not Included. This 3' X 5' cotton Heritage 50 star flag is truly unique. Has the look and feel of old style heavy cotton. Features sewn stripes and embroidered stars and is tea stained to make it look antiqued for an authentic, weathered look. Finished with reinforced canvas header and two brass grommets. 100% made in the U.S.A. Pole Not Included. 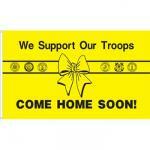 New We Support Our Troops Flag is a great way to show them we care. 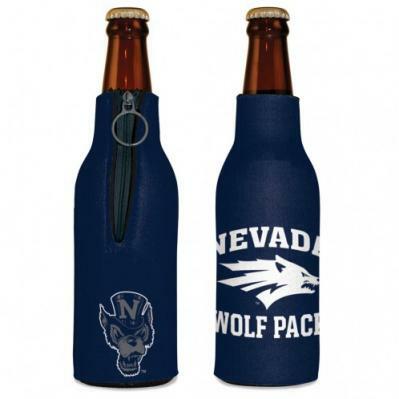 Made of quality outdoor knitted polyester and finished with canvas header and two grommets. 3" x 5" size only. Designed and manufactured by our company. Our new and beautiful Thank You Veterans Flag is designed and manufactured by our company in Nevada. Made of quality outdoor knitted polyester and finished with reinforced canvas header and two brass grommets. 3' X 5' Size only. Made of outdoor quality knitted polyester and finished with canvas header and two brass grommets. Made right here by us. Made of quality outdoor SolarMax nylon material. Finished with reinforced canvas header and two brass grommets. 100% Made in America. Digitally printed on outdoor knitted polyester material, finished with canvas header and two brass grommets. 100% Made in America. 100% made in America. The original Betsy Ross Flag was adopted on June 14, 1777. It is believed that George Washington was instrumental in designing the Flag. 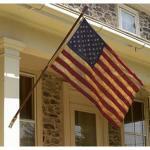 Flag is made of quality Solar Guard nylon and features embroidered stars and sewn stripes. 3' X 5' 100% made in America Gadsden flag. Named after Colonel Christopher Gadsden, was flown in 1776 by Commodore Hopkins, First Commander-in-Chief of the Continental Fleet. It's inscription was a warning by the colonists to the British. The Gadsden flag is still used today for protest by many. Made of quality outdoor Solar Guard Nylon, finished with canvas header and two brass grommets. 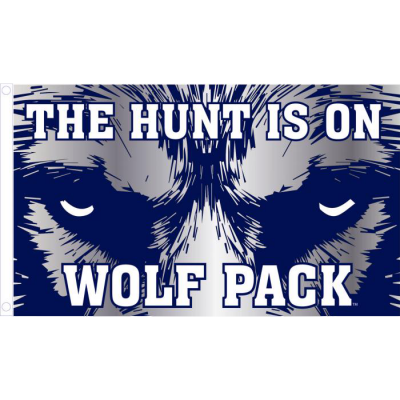 Made of quality outdoor polyester material. Finished with reinforced canvas header and two brass grommets. 100% Made in America. The 3' x 5' We Support Our Troops flag was designed & produced by us during the 1991 GulF War as a fundraiser to support the families of the veterans serving in the Gulf War. The flag is still very poplual today. Made of quality knitted polyester and finished with canvas header and two brass grommets. 100% Made in America.